Your passport must have 6 months validity from the date of sail (5 OCT 2020). Please check with your travel agent to see if you require a visa. Generally, Australian Passport holders do not normally require visas to enter New Caledonia. Type in your surname, reservation number, departure date of the cruise and the ship name (Serenade of the Seas). When you check in at the Overseas Passenger Terminal, you will receive your Sea Pass card. This is the key to your cabin and is also your charge card to use for all ship purchases once on board. Drinks, shore excursions, onboard shopping, medical centre and even charges at the casino are charged back to your cabin account via your Sea Pass card. At check in, your credit card will be swiped by the check in staff (as it would at a hotel). However, if you do not have a credit card, you will need to arrange to leave cash as a security against possible on board expenses. You may pay in cash but will be charged at the prevailing onboard rate. You can obtain an itemized cabin statement at any time from Guest Services. A credit card is the easiest way to pay for your on board account at the end of the cruise. You don’t even need to line up to pay for this at the end of the cruise as a copy of your account will be delivered to your cabin and your credit card will be charged automatically. If you have a disputed charge, you can check it with Guest Services. ATMs are also available onboard. Additional charges do apply for making withdrawals from the ATM plus your banks charges. Laundry, dry-cleaning and pressing services are available on board Serenade of the Seas. There is NO self-serve laundry. Due to ship safety regulations, you are NOT permitted to bring travel irons on-board. 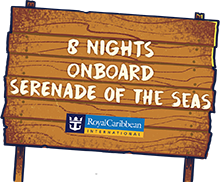 Each evening in your cabin you will receive a copy of COMPASS, your official guide to what is happening on board Serenade of the Seas for the following day. Please take the time to read this each day as it will contain vital information on all Cruisin’ Country events as well as other on board activities. Ask your Cruiseco agent for relevant info. There is excellent duty free shopping on board, however please note standard Customs regulations apply to alcohol & tobacco purchases. When these items are purchased, they will be stored on the ship for you and delivered to your stateroom on the last night. Duty free items cannot be consumed onboard. All duty free shopping is charged to your Sea Pass card. Cruisin’ Country has arranged for the cream of Australian country music stars and their incredibly talented family members to perform for you whilst on board Serenade of the Seas. The actual times for each performance will appear in your daily Compass newsletter, delivered to your stateroom each evening and highlighting the following day’s activities. To allow all passengers a chance to see each performance, once on board you will receive a coloured ticket which allows you entry to see each of the main headliner acts appearing in the Tropical Theatre. You will visit 3 ports of call – Lifou, Isle of Pines, & Noumea (New Caledonia). The ship may change course at any time without notice if their intended course could in any way endanger passengers. For more information on itinerary and ports of call, click here.